Sun Ra, piano; Marshall Allen, alto sax; James Jacson, reeds, flute and percussion; Michael Ray, trumpet; Ahmed Abdullah, trumpet; Tyrone Hill, trombone; Bruce Edwards, guitar; Jothan Callins, electric bass; Buster Smith, drums and others not listed. While this double album is an engaging set, including as it does many of Ra 'standards' such as Fate In A Pleasant Mood, Love In Outer Space, Shadow Worlds, Space Is The Place and The Mayan Temples, the recording quality is poor and it is by no means one of the Arkestra's best performances, though it is good in parts. Mostly, in spite of great effort from Marshall Allen on alto, it is a bit messy and doesn't attain lift-off. Sun Ra was at this time 77 years old and had had a stroke two years before, so was probably at his weakest ever and it shows. Remember too that he had been at it since the 1950s. It is thought that this recording was an amateur effort possibly from the audience, so doubtless this excuses some of what's missing. Ra was often thought of as weird: his early writing was very much of the hard-bop style, but with modal configurations behind them. The late 60s saw the Arkestra playing music that was improvised entirely, this heralded in 1965 by The Magic City, on Evidence Records. This was a nutshell of extended, free improvisation, delivered by the Arkestral cooperative. It was an album of music which was to influence many of the avant-garde musicians of the time and most particularly perhaps, John Coltrane. Now there's an album for your collection. 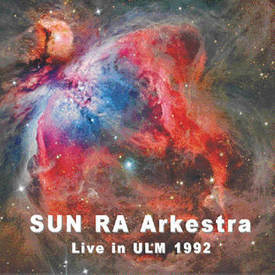 Though Live in Ulm 1992 is not a seminal recording, it is still revealing of Sun Ra's musical intentions and leanings. Marshall Allen excels as do Michael Ray and Ahmed Abdullah on trumpet and Tyrone Hill, trombone. Absolute enthusiasts should perhaps seek out the earlier recordings – Space Is The Place, Impulse 1972, is another must-have, along with The Magic City.